Thanks to your feedback, Swimia has develop into in just a number of months one one of the most necessary internet sites of swimming pools. Here you could have all of the info we know about Erlebnis-Hallenbad - Mittenwald, in Mittenwald. 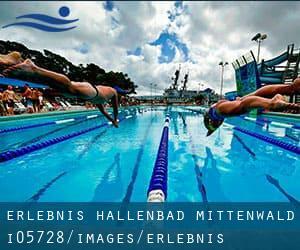 Don't forget you can also promote this pool so Erlebnis-Hallenbad - Mittenwald will appear the very first of Mittenwald, or perhaps the first of your country, make contact with us to know much more. Across from the tourist information office. Updated on 2019 Seeshaupter Straße 24 , Penzberg , GERMANY (Postal Code: 82377). Among all the activities supplied by the center, for anybody who is thinking about swimming you will take pleasure in 35 meters x 14 meters, Indoors. Just in case you would like to contact this Swimming Pool before dropping by, we only know the phone number. Updated on 2019 Waldluststraße 6 , Haar , GERMANY (Postal Code: 85540). This sports center delivers 25 meters x 12.5 meters, 0.3 meters - 1.8 meters depth, 0.3 meters - 1.8 meters depth, Indoors. For this Swimming Pool, only phone number is number here. Updated on 2019 Jochamstrasse 12 , Freising , GERMANY (Postal Code: 85354). Swimmers like you reported 25 meters x 12.5 meters, 1.4 meters-2.3 meters depth, 1.4 meters-2.3 meters depth, Indoors. Unfortunately we do not have the email address of this Pool, but we can give you the phone number. Updated on 2019 Jahnstrasse 6 , Geretsried , GERMANY (Postal Code: 82538). This sports center offers 25 meters x 12.5 meters, 1.8 meters depth, 1.8 meters depth, Indoors. Contact information for this Swimming Pool for example phone number and e-mail address are number. Updated on 2019 Südliche Ringstraße 63 , Ingolstadt , GERMANY (Postal Code: 85053). This sports center delivers 25 meters, 5 lanes, Indoors. Contact information for this Swimming Pool for example phone number and email address are number. Updated on 2019 Wilhelminastrasse 5 , Bad Wiessee , GERMANY (Postal Code: 83707). This sports center delivers 25 meters x 12.8 meters, Indoors. For this Swimming Pool, only phone number is number here. Updated on 2019 Landrat-Müller-Hahl-Str. 15 , Kaufering , GERMANY (Postal Code: 86916). Among all the activities offered by the center, if you're considering swimming you can expect to get pleasure from 25 meters, 4 lanes, Indoors. If you should contact this Swimming Pool, email address and phone number are both number. Updated on 2019 Postillonstrasse 17 , Munich , GERMANY (Postal Code: 80637). Among all the activities provided by the center, if you are considering swimming you will get pleasure from Olympic size, 8 lanes, Outdoors. If it is advisable to contact this Swimming Pool, email address and phone number are both number. Updated on 2019 Stemplingerstraße 2 , Rosenheim , GERMANY (Postal Code: 83022). Swimmers like you reported 25 meters, Indoors. Phone number and email address are number for this Swimming Pool. Updated on 2019 Hans-Keis-Straße 59 , Pullach im Isartal , GERMANY (Postal Code: 82043). Among all the activities supplied by the center, if you're thinking about swimming you will take pleasure in 25 meters x 12.5 meters, 5 lanes, 1.2 meters - 2 meters depth, 1.2 meters - 2 meters depth, Indoors. If you need to make contact with this Swimming Pool, email address and phone number are both number. Updated on 2019 Im Loh 2 , Oberhaching , GERMANY (Postal Code: 82041). This sports center delivers 25 meters x 12.5 meters, Indoors. Contact facts for this Pool such as phone number and email address are number.